Lately I've been very interested in the concept of creating something beautiful and creative, out of a traditional base. This colour scheme will work in almost any traditional setting. It's warm, welcoming, with just the right amount of interest. The lavender is an unexpected pop and you will see soon how wonderful it can look! When viewed like this, the florals can seems a little too feminine, but the stripes add masculinity and you only need a little of each. You need to be careful to mix Large Scale and Small Scale patterns. The colours can tie together but do not need to actually match. For this scheme I've chosen a Resene paint called Thordon Cream - it has a greyish base rather than a yellow one, which looks amazing with reddish brown tones. 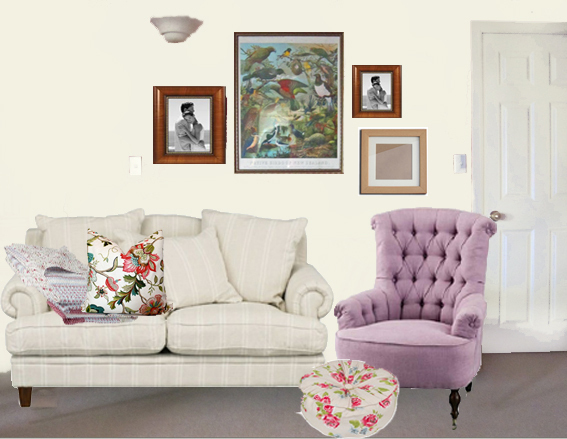 The lavender tufted armchair has changed my mind about purple forever! One of these in the corner of the room would be bliss. A mixture of picture frames grouped together on the wall adds interest and the simple country patterns make it sweet and homely. For fun, I've modelled this in Photoshop onto my parent's living room... it's rough of course, but you get the idea. (The walls are actually currently a deep crimson!). I love their old 'Birds of New Zealand' print on the wall (the others were photoshopped in). I for one never thought I would be a fan of lavender in this setting, but I really like it. 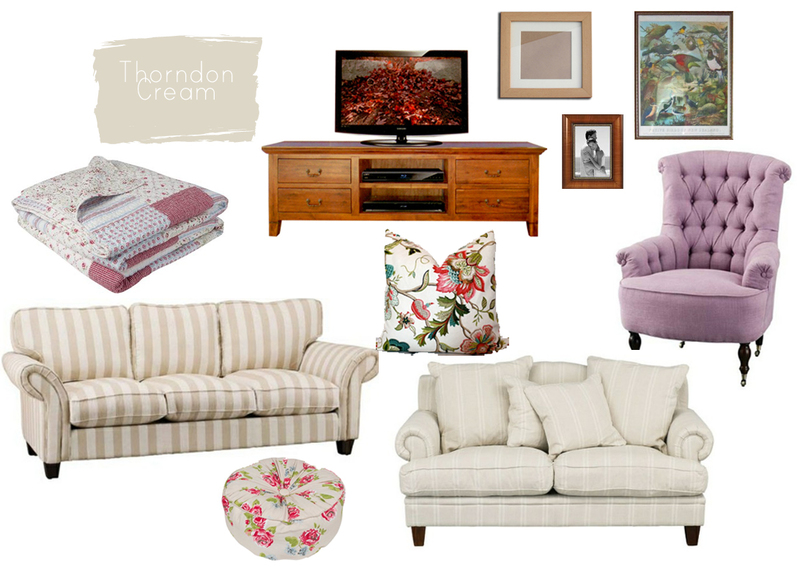 In fact I have a traditional dining room coming up in the next post, with a little more. How do you feel about 'Traditional' style decorating? Oh wow how lovely! I'm all for this decorating style. Its beautiful! I love the lavender chair and the pillow. So pretty! love, Love, LOVE the large floral print pillow!!! !